Today is 'waiting day'. Currently we are waiting for Baby's doctor to run a few more tests and re-evaluate his condition. He is still on the Heart and Lung machine to allow his heart to rest as much as possible. Yesterdays' surgery took much longer than the doctor originally expected due to a few 'road blocks'. The doctor plans to slowly allow Baby's heart to work on its own, with out the machine. If all goes according to plan we will be starting the weening process today. 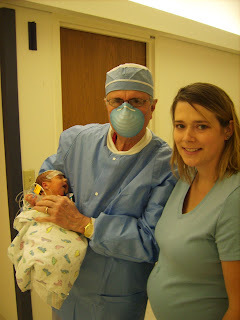 I was asked by the doctor and nurses to carry Baby Todd back to the OR. The doctor with us is one of the Baby's anesthesiologists. Thanks, Jerri for the update. I know you have a lot on your mind and may not have time for blogging. I'll be praying that weaning from machine goes well and that his heart will take over. I think he looks like Dusty. God keeps bringing you guys to my mind this afternoon, which also means that I've been praying too! I've really appreciated your taking time to keep us updated. The girl's videos you posted where great! They are too much fun. Baby is lucky to have such wonderful sisters and parents. We will miss you tonight. Jerri, tonight at small group is the submission lesson you wanted us to live feed to you. Not sure we will pull of the live feed but we'll be sure to capture the "highlights" and fill you in. We'll definitely miss you though with all your insight and ability to make us all laugh. Hope that the road blocks are behind you now and that baby transitions off the machines well. Our hearts are with you! Thanks Jerri for the update on Todd, I pray that he will soon be weaned off the machines and breathe on his own. You and your family are consistently in our thoughts and prayers.